Piranha Box is service tool which allows Mobile Service Center to do the Service of Smartphone, Tablets and FeaturePhone. 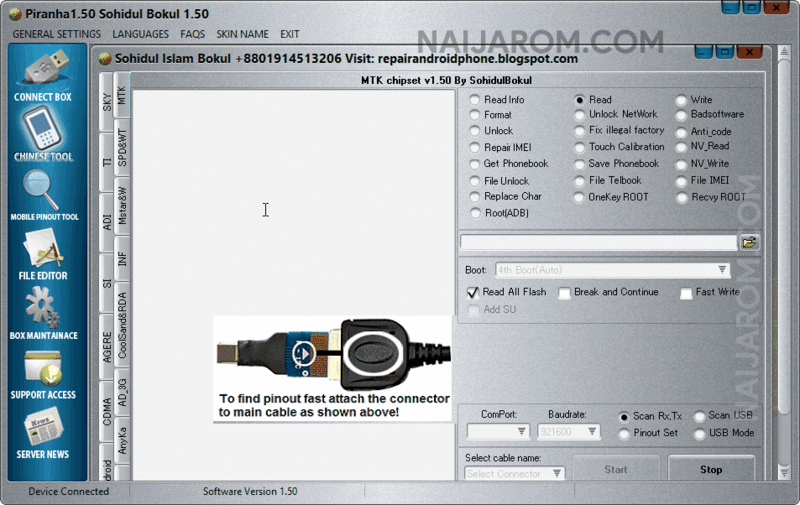 It allows you to Flash Stock firmware on Mediatek, Spreadtrum and Qualcomm devices. It also allows you to flashing or repairing the IMEI, Removing Pattern Lock, Formatting the Device, unlocking the network of your device, saving phonebook, rooting the device. It also allows you to file unlock, replace the char characters, file telbook, touch calibration, fix illigal factory settings, fix bad software issue, read the NV data, recovery root. [*] Credits: Piranha Box 1.50 Tool is created and distributed by Piranha Team. So, full credits goes to Piranha Team for sharing the tool for free.